We Live In A Political World: #294 / Mother Nature, Version 2.0? #294 / Mother Nature, Version 2.0? Genesis begins with these words: "In the beginning, God created the heaven and the earth." For those who feel a little uncomfortable with the idea of "God,"it's possible just to leave "God" out of the equation. The main point of the text in Genesis is that WE did not create the heaven and the earth. We are, in fact, creatures (owing our existence and life to whatever Person or process brought us to the place where we now find ourselves). We have been given our existence, here in the World of Nature, on this lovely planet, and within the complex universe we see around us. The World of Nature - the world that is, in fact, the "heaven and the earth" - is the world upon which we ultimately depend. We did not create it ourselves. We do, of course, have the ability and power to make whatever arrangements we may want to make within this World of Nature, within all the heavens and the earth. Our own world, in other words, within the World of Nature, is definitely open to our own creative actions, and depends upon us - on our own choices, both individual and collective. 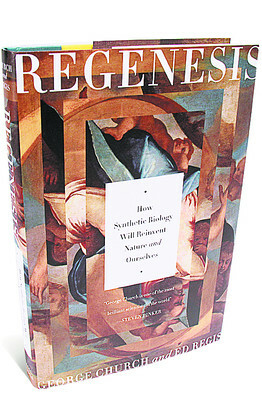 George Church and Ed Regis, authors of the book Regenesis: How Synthetic Biology Will Reinvent Nature and Ourselves, apparently think that we are now about ready to move beyond the Genesis concept. They posit that a kind of "garage biology" will soon give human beings the ability to create new forms of life, and to reengineer ourselves. We will be able, in other words, to become our own creation. Church and Regis also seem to think that there might be some problems with that, at least as I understand a review of their book written by Scott Gottlieb. Theology aside, I think there is a problem with the idea that we should now assume responsibility for creating the world upon which all life depends. Frankly, a little humility would be in order.